First Errol Spence picked on a little guy. Now he’s after an old guy. Errol, with due respect, you’re going to have to pick on someone who doesn’t enter the ring at a distinct disadvantage at some point. Spence turned in a brilliant performance against the smaller Mikey Garcia last Saturday, enhancing his reputation in what had seemed to be a no-win situation because Garcia was attempting the impossible by moving up two divisions to challenge for Spence’s welterweight title. The champ looked to the eye like a fighter who belongs in the conversation with Vasyl Lomachenko and Terence Crawford as the No. 1 fighter pound-for-pound. The problem is that’s not something he can prove in such a physical mismatch. We can admire what we saw – a shutout of a very good, albeit miniature opponent – but it shouldn’t be considered a defining fight for the winner. He must defeat a top, legitimate 147-pounder (Terence Crawford? Keith Thurman?) to claim one of those. And, unfortunately, Spence’s next fight isn’t likely to be significantly different. 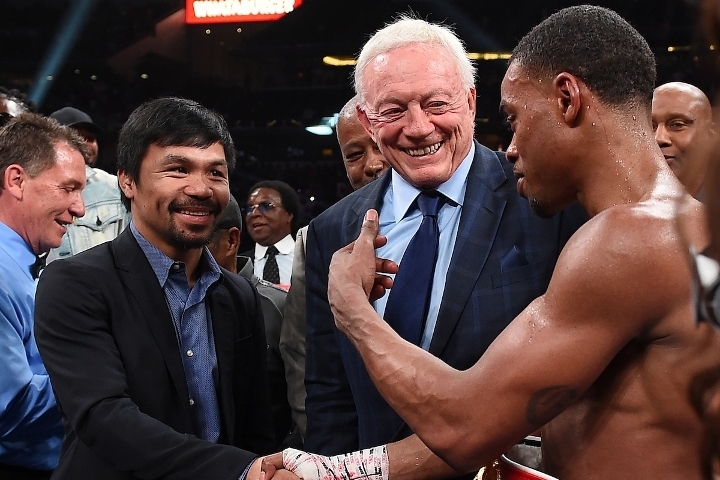 Manny Pacquiao joined Spence in the ring immediately after the latter’s victory over Garcia at AT&T Stadium outside Dallas, which seemed to be the first component in a marketing campaign to sell that fight to public. Spence vs. Pacquiao makes perfect sense from a business standpoint. The fans would happily fork over an exorbitant pay-per-view fee in big numbers, which means Spence (as well as Pacquiao) would make a fortune. And who could blame him? He risks his well-being every time he steps through the ropes. He deserves to make as much money as possible while he can. Plus, a victory over Pacquiao would add immeasurably to Spence’s star (read: earning) power because of the Filipino’s name and the immense exposure he’d receive in the mega-fight. All that acknowledged, we can’t pretend it’s a good matchup. It’s not. Pacquiao remains a good fighter at 40 years old, which he demonstrated most recently by easily outpointing Adrien Broner, but he’s not the fighter he was. This version of Pacquiao, slower and less active in the ring, no longer has the tools to cope with an unusual specimen like Spence. And remember: While Pacquiao is comfortable near 147 pounds, his dimensions are similar to Garcia’s. Garcia is listed as 5 feet, 6 inches (168 cm), Pacquiao 5-5½ (166). Garcia has a reach of 68 (173), Pacquiao 67 (170). Spence is 5-9½ (177) and has a reach of 72 inches (183). It’s difficult to gauge how much trouble Garcia had with Spence’s strength advantage but he clearly had difficulty with the taller man’s length, which allowed the winner to control the distance between them and the fight. Pacquiao probably would land more punches than Garcia did because of his style – constant movement, punching from different, unexpected angles – but Spence’s longer reach and ability to use it effectively would again give the titleholder a tremendous edge over a smaller man. Pacquiao simply cannot outbox Spence, which would give the challenger almost no chance to win the fight. He isn’t going to score a knockout against a big, strong 147-pounder, either. The only stoppage Pacquiao has over the past decade was a technical one over a shot Lucas Matthysse last July, which proved nothing. I fear for Pacquiao’s well-being. I can envision a scenario where the older man is too slow – in terms of both hand and foot speed, as well as reflexes – to avoid Spence’s power shots and takes a beating as a result. I keep thinking that what Pacquiao did to Oscar De La Hoya could happen to him in this fight. I tried an experiment. I removed Pacquiao’s name from the equation and simply judged the fighter who fairly easily outpointed Broner in January. I believe that fighter is better than all but a few 147-pounders, which means that any athletic commission (Texas again?) would be justified in approving the matchup. That makes me feel a little better about it. But the fact remains this is Pacquiao we’re talking about. No one wants to see an immensely popular, once-great former champion suffer the fate of De La Hoya. And the fact also remains that Spence vs. Pacquiao is a mismatch, although that has as much to do with Spence’s ability as any deficiencies on Pacquiao’s part. Again, I get it. Spence wants to fight Pacquiao because of the money involved. The same goes for Pacquiao, who wants to maximize his earnings before he retires. This is prizefighting, after all. And, no, Pacquiao isn’t comparable to Conor McGregor in the mixed-martial artist’s farce with Floyd Mayweather Jr. in 2017. Pacquiao is an actual boxer who has earned the right to face someone like Spence. I hope Pacquiao would turn back the clock enough to make it a competitive fight, not a horribly one-sided exhibition like the one we saw last Saturday. Alas, Spence probably would handle Pacquiao as easily as he handled Garcia. And the victory would be seen by many as further proof of Spence’s special ability. In reality, he will have beaten a well-past-his-prime 40-year-old who really didn’t have a chance to win the fight. [QUOTE=Letmaku;19612057]Spence should accept $3M to accommodate Pacman's $30M retirement check if he really wants to beat the FOTD and the only 8 divisions champ. [/QUOTE] Manny should back his mouth up instead of running away from it. Spence should accept $3M to accommodate Pacman's $30M retirement check if he really wants to beat the FOTD and the only 8 divisions champ. Errold Spence should declare a pay cut if he really wants to retire Pacman for good! The retirement check can be $30M versus Spence for July 2019 ($20M vs Crawford back in 2017) & $50M Pacman Mayweather!